To all my friends, family and readers - Merry Christmas and Happy New Year. It's been an eventful year for me, and I look forward to what 2015 holds. Maybe 2015 is the year of the Linux desktop??? Here's an annoying problem that I lost a few hours solving. You use Team Foundation Server locally (not visualstudio.com). You have moved the TFS site in IIS to a new vhost and added an additional port binding. You have used the TFS console and changed the Notification / Web access URL to reflect your changes in IIS. You can access the website fine on the new binding. But you cannot check out code / clone the repository (Git) - "Authentication failed". The issue is down to the accepted authentication methods for the vhost in IIS. 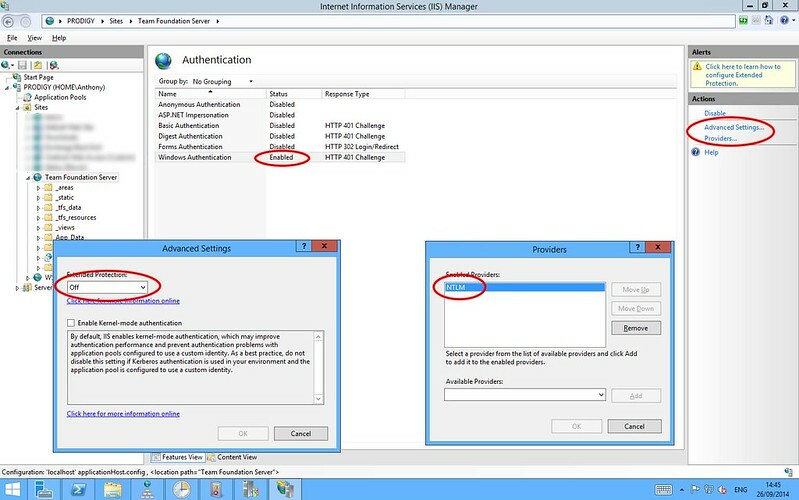 Open the IIS Manager, browse to your TFS website in the Site tree. Open up the Authentication options. Enable only "Windows Authentication". Then click Advanced Settings on the right. On the right again, click Providers. Remove all providers, leaving only "NTLM" enabled. Job done. I use TFS with Git repositories. Prior to solving this, the web access worked fine, but cloning a repo with Git would give the error "Authentication Failed". These settings changes mimic the default vhost authentication settings, which are not necessarily the same as IIS's defaults when creating the site. For the past 3 years, I have been using the DynDNS paid service for my Dynamic DNS needs. Before that, I was using their free service, and even before that, No-IP. As you may (or may not) have seen, earlier this year - Dyn shut down their free service. This didn't effect me, I was part of the elite paid members club. But it did rather annoy me, because that same free service, was perfect for so many people. I don't feel good about supporting a company which leaves so many people dead in the water, so, I won't be renewing on my Dyn account this year. Instead, I've moved everything over to CloudFlare. Now, CloudFlare don't really advertise their Dynamic DNS offerings, but they exist, and they are free! The nature of how CloudFlare works to mitigate DOS attacks and provide traffic monitoring, lends itself perfectly to DDNS. So when you set up a domain, you have some really attractive TTL values, down to 5mins. Oooh, and they have an awesome API to control the record updates. 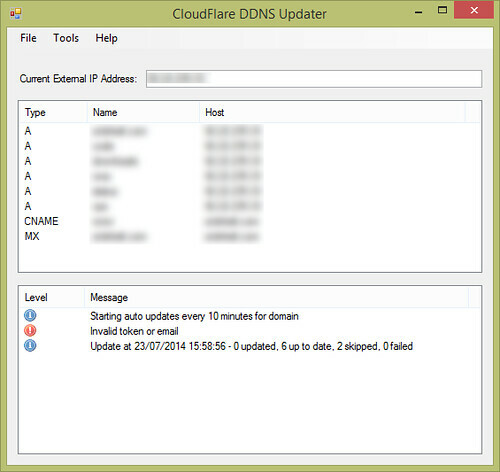 If you're using Linux, CloudFlare offer a modified ddclient for performing the updates. Windows offerings are somewhat sparse, the best I could find was Perl based. Me being me, I decided to hack something together. I should point out, my client is no where near production ready. It does awful things like ignoring MX records, and updating EVERY A RECORD. I will be continuing development of this, and accepting pull requests on GitHub. I needed some extra storage in my workstation. Coffee, stack of drives and a bunch of objective testing later - we have a winner.